Washable school glue bonds to most porous surfaces like paper and cloth, as well as semi-porous surfaces such as wood and ceramics. Washes out with soap and water. 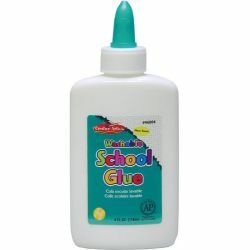 Ideal for school and arts and crafts projects. AP Certified, non-toxic. Conforms to ASTM D-4239.